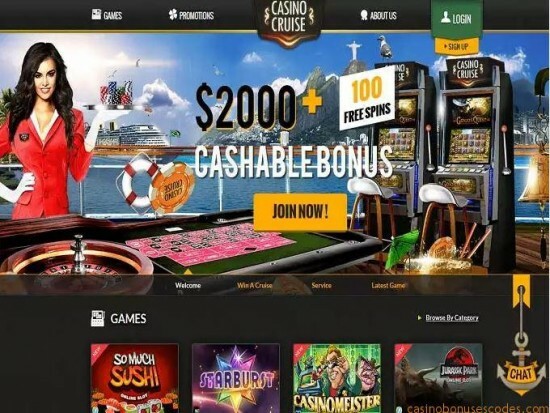 As you visit the homepage of Casino cruise, you would actually feel as if you are sitting aboard a cruise and the roulette table is right there on the deck. The games of Casino Cruise are powered by NYX Interactive, Evolution Gaming, Play’n Go, Net Entertainment and Microgaming. You can play the games instantly through browser of your system and there is no need to download any software on the computer at all. 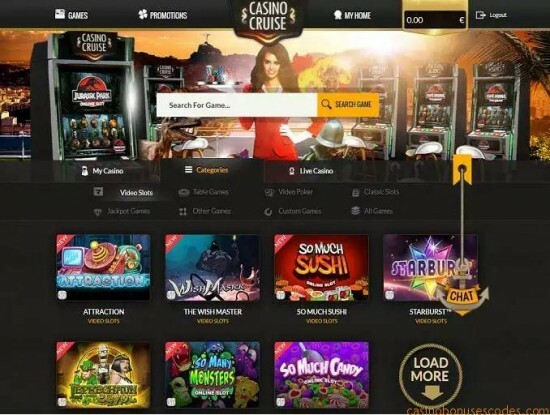 You can play around 200 games of Casino cruise through mobile as well. The players are welcomed onboard with a total bonus of $1000 on the first four deposits done by the player. The 1st deposit has a match of 100% upto $200 and along with that 100 free spins are also given. The 2nd deposit has a match of 50% upto $200, the third and fourth deposits have a match of 25% upto $300. 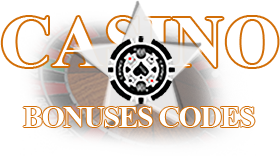 The spins that are given free as a part of the welcome bonus are valid for 24 hours. Apart from this, there is a whole list of bonuses available on Casino Cruise. With Friday Freebies you can get a special reward as you deposit and play for the whole week. The wonderful graphics of the games will simply set your mood as you sail through in the ocean. There are more than 600 games which are available over various categories. Whether you are a table game aficionado or are in love with video poker or jackpot games, you would find multiple games of your choice in the library of Casino Cruise. Some of the popular Video slots games that are available on the cruise are Wizard of Gems, Lucky Twins, Lady of Fortune, Dragon Dance, Stardust, Starburst, Samba Carnival etc., and these are just the tip of the iceberg. There are more than 20 video poker games which include Deuces Wild MH, Jacks or Better, Joker Poker, Double Joker Power among others. If you want to deal with a live dealer, you will get multiple live casino games that include live Blackjack, Live Roulette, Live Baccarat VIP and many mores, however the game of your choice can be played subjected to availability. The minimum deposit and minimum withdrawal amount at Casino Cruise is $10. The monthly cashout limit is $22,000 and for VIP accounts it is $50,000. E-Wallet cashouts are done instantly, whereas the cashout time for credit or debit cards or bank transfers take 3 to 4 business days usually. 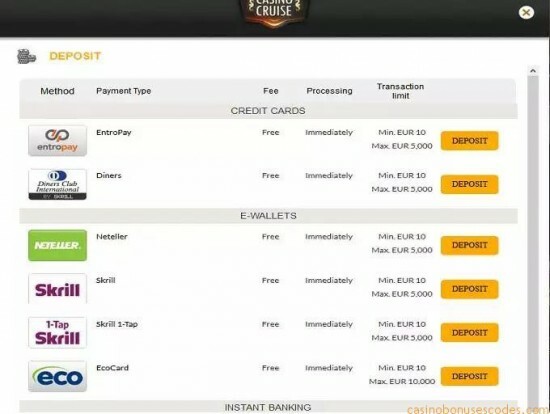 For any payment related concerns, one can always contact the live chat that is seen in the icon of an anchor on every page of the website of Casino Cruise.